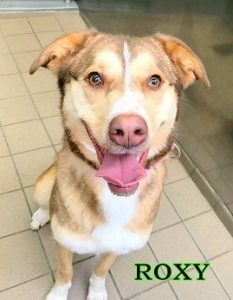 ROXY thinks she is a Rock Star..
She is a friendly, 1 year old Husky/Shepherd stray from Islip Town Shelter…who struts around Last Hope like a bubbly kid, waiting to be asked to do her big trick-SIT. This entry was posted in 6 to 12 Months, Dog Center, Dogs, Female. Bookmark the permalink.